James Clerk Maxwell (June 13, 1831 – November 5, 1879) was a brilliant Scottish mathematician and theoretical physicist. He developed a mathematical expression, called Maxwell's equations, that described the actions of electricity and magnetism and their interrelationship, and from these predicted the existence of electromagnetic waves traveling at the speed of light. Maxwell was also the first to peer into the dimensions of the molecular world by calculating the average distance a gas molecule travels before it hits another molecule. Maxwell also produced the first color photograph. James Clerk Maxwell was born on June 13, 1831, in Edinburgh, Scotland, to John Clerk and Frances (née Cay) Maxwell. His birthplace, at 15 India Street, is now the location of the International Centre for Mathematical Sciences. Maxwell grew up on his father's estate in Dumfrieshire, in the Scottish countryside. Maxwell's parents quickly recognized their son's inquisitive nature. His mother took responsibility for his early education, which in Victorian times was largely the job of the woman of the house. She died in 1839, however, when Maxwell was only eight. His father then undertook the education of his son with the aid of his sister-in-law, Jane Cay, both of whom played pivotal roles in Maxwell's life. His formal education began under the guidance of a hired tutor, but finding this arrangement less than satisfactory, John Maxwell sent his son to the Edinburgh Academy. Maxwell was captivated by geometry at an early age. Much of his talent went unnoticed however, and his academic work remained unremarkable until, in 1845, at the age of 13, he won the school's mathematical medal, and first prizes for English and for English verse. His first piece of original work, at the age of 14, was a paper describing mechanical means of drawing mathematical curves with a piece of twine, and properties of ellipses and curves with more than two foci. This work, Oval Curves, was published in an issue of the Royal Society of Edinburgh, and although it shows the curiosity of Maxwell at a young age, it is important to note that the work itself was not mathematically profound. Unlike other great minds, such as Gauss, Pascal, or Mozart, Maxwell was not a child prodigy. Rather, his genius would slowly mature. A young Maxwell at university. Maxwell left the Academy in 1847, and enrolled at the University of Edinburgh. He completed his studies at Edinburgh in natural philosophy, moral philosophy, and mental philosophy under Sir William Hamilton, 9th Baronet. In his eighteenth year, he contributed a paper to Transactions of the Royal Society of Edinburgh, "On the Equilibrium of Elastic Solids." In 1850, Maxwell left for Cambridge University and initially attended Peterhouse, but eventually left for Trinity College where he believed it would be easier to obtain a fellowship. In November 1851, Maxwell studied under the tutor William Hopkins, (nicknamed the "wrangler maker"). In 1854, Maxwell graduated with a degree as second wrangler in mathematics from Trinity (scoring second-highest in the final mathematics examination) and was declared equal with the senior wrangler of his year in the more exacting ordeal of the Smith's prize examination. Immediately after taking his degree, he read to the Cambridge Philosophical Society a novel memoir, On the Transformation of Surfaces by Bending. This is one of the few purely mathematical papers he published, and it exhibited at once to experts the full genius of its author. About the same time, his paper, On Faraday's Lines of Force appeared, in which he gave the first indication of some of the electrical investigations which culminated in the greatest work of his life. In 1855, Maxwell was appointed to the chair of Natural Philosophy at Marischal College, Aberdeen. In 1858, he married Katherine Mary Dewarin, the daughter of the principal of Marischal College. The couple had no children, but Maxwell often enjoyed the assistance of his wife in his duties. When Marischal merged with another college to form the University of Aberdeen, Maxwell's position was eliminated, but he soon found another, joining the teaching staff of Kings' College, London, as professor of natural philosophy. 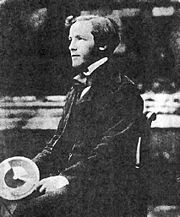 In 1859, Maxwell won the Adams prize in Cambridge for an original essay, On the Stability of Saturn's Rings, in which he concluded the rings could not be completely solid or fluid. Maxwell demonstrated that the rings could only be stable if they consisted of numerous small solid particles, which he called "brickbats." He also mathematically disproved the nebular hypothesis (which stated that the solar system formed through the progressive condensation of a purely gaseous nebula), forcing the theory to account for additional portions of small solid particles. On the foundation of an earlier paper written in 1855, he wrote in 1860, a paper "On the Theory of Compund Colours," which demonstrated that color blindness results from a deficiency in sensitivity to one of the three primary colors. For this paper, he was awarded the Rumsford Medal of the Royal Society. He was elected a member of the society a year later. One of Maxwell's most important achievements was his contribution to kinetic theory of gases. Originating in its modern form with Daniel Bernoulli in the eighteenth century, this theory was advanced by the successive labors of John Herapath, John James Waterston, James Joule, and particularly Rudolf Clausius, but it received enormous development from Maxwell, who in this field appeared as an experimenter (on the laws of gaseous friction) as well as a mathematician. Joule had calculated the speed of molecules, but it was left in the lap of Clausius to explain why gases did not diffuse as rapidly as their speed would indicate. Clausius said that the slowness of a scent, for example, to travel in the air, was due to the many collisions among molecules that would resist its transit. The average distance a molecule would travel between the collisions Clausius called the "mean free path." Inspired by Clausius's work, Maxwell, using experimental data on viscosity, heat conduction, and diffusion in gases, along with a complex mathematical analysis of collisions of large numbers of molecules, calculated the mean free path of a molecule. This represented the first approximation of a measurement of atomic dimensions. Five years later, based on Maxwell's calculations, Josef Loschmidt published the first estimate of the actual size of a molecule. In 1866, Maxwell improved his treatment of the kinetic theory of gases, and published what is now called the Maxwell-Boltzmann distribution, which yields the fraction of gas molecules in a sample moving at a specified velocity at a given temperature. In 1865, Maxwell moved to the estate he inherited from his father in Glenlair, Kirkcudbrightshire, Scotland, and in 1868, resigned his Chair of Physics and Astronomy at King's College, London. A postcard from Maxwell to Peter Tait. The greatest work of Maxwell's life was devoted to electricity. Maxwell's most important contribution was the extension and mathematical formulation of earlier work on electricity and magnetism by Michael Faraday, André-Marie Ampère, and others into a linked set of differential equations (originally, 20 equations in 20 variables, later re-expressed in quaternion- and vector-based notations). These equations, which are now collectively known as Maxwell's equations, were first presented to the Royal Society in 1864, and together describe the behavior of both the electric and magnetic fields, as well as their interactions with matter. Maxwell formulated these equations by assuming the existence of a displacement current which takes place in the dielectric separating the plates of a capacitor. This was an original contribution of Maxwell, and enabled him to treat the space between conductors as a medium with certain properties rather than just a vacuum. Maxwell showed that the equations predict the existence of waves caused by oscillating electric and magnetic fields. Maxwell calculated the speed of such waves, finding that they would travel at a velocity of 310,740,000 m/s, roughly the same as the speed of light, which had already been measured. He concluded that light must be an electromagnetic phenomenon. Subsequent experimenters such as Heinrich Hertz and Oliver Lodge successfully generated and detected the electromagnetic waves predicted by Maxwell. Maxwell's quantitative connection between light and electromagnetism is considered one of the great triumphs of nineteenth century physics. Maxwell's assumption that an actual medium existed that carried the light waves was later challenged by experiments failing to show any movement of the earth with respect to this medium, and, on a theoretical basis, by Einstein's theory of relativity, which assumes that light travels at the same speed irrespective of the velocity of the observer. The first permanent colour photograph, taken by James Clerk Maxwell in 1861. Maxwell also made contributions to the area of optics and color vision, being credited with the discovery that color photographs could be formed using red, green, and blue filters. He had the photographer Thomas Sutton photograph a tartan ribbon three times, each time with a different color filter over the lens. The three images were developed and then projected onto a screen with three different projectors, each equipped with the same color filter used to take its image. When brought into focus, the three images formed a full color image. The three photographic plates now reside in a small museum at 14 India Street, Edinburgh, the house where Maxwell was born. Maxwell wrote an admirable textbook, Theory of Heat (1871), and an elementary treatise, Matter and Motion (1876), which serves as an introduction to physics. 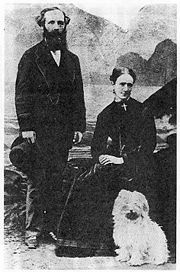 James and Katherine Maxwell, 1869. In 1871, Maxwell was appointed the first Cavendish Professor of Physics at Cambridge. Maxwell was put in charge of the development of the Cavendish Laboratory. One of Maxwell's last contributions was the editing (with copious original notes) of the electrical researches of Henry Cavendish, from which it appeared that Cavendish researched such questions as the mean density of the earth and the composition of water. Much of Maxwell's time was consumed with the editing of Cavendish's papers. This project took him away from what might have been more fruitful ventures in pure science. He died in Cambridge of abdominal cancer at the age of 48. He is buried at Parton Kirk, near Castle Douglas in Galloway, Scotland. The extended biography The Life of James Clerk Maxwell, by his former schoolfellow and lifelong friend Professor Lewis Campbell, was published in 1882, and his collected works, including the series of articles on the properties of matter, such as Atom, Attraction, Capillary Action, Diffusion, Ether, etc., were issued in two volumes by the Cambridge University Press in 1890. From the start of his childhood, religion touched all aspects of Maxwell's life. Both his father and mother were devout churchgoers (Presbyterian and Episcopalian). The occasional reference to the divine in his writings indicates that his faith was a guiding force in his life. Maxwell was ranked #24 on Michael H. Hart's list of the most influential figures in history and #91 on the BBC poll of the 100 Greatest Britons. The maxwell (Mx), a compound derived CGS unit measuring magnetic flux (commonly abbreviated as f). Maxwell Montes, a mountain range on Venus, one of only three features on the planet that are not given female names. The James Clerk Maxwell Telescope, the largest sub-mm astronomical telescope in the world, with a diameter of 15 meters. The 1977 James Clerk Maxwell building of the University of Edinburgh, housing the schools of mathematics, physics, computer science, and meteorology. The James Clerk Maxwell building at the Waterloo campus of King's College London, in commemoration of him being Professor of Natural Philosophy at King's from 1860 to 1865. The university also has a chair in Physics named after him, and a society for undergraduate physicists. The £4 million James Clerk Maxwell Centre of the Edinburgh Academy was opened in 2006, to mark his 175th anniversary. James Clerk Maxwell Road in Cambridge, which runs along one side of the Cavendish Laboratory. The University of Salford's main building has also been named after him. James Clerk Maxwell was featured in the 1995 Super Nintendo Entertainment System game, Tales of Phantasia, as a summon that can aid the party in battle. His ability consisted of electromagnetic spheres that attacked the enemy. Maxwell, James Clerk, "On the Description of Oval Curves, and those having a plurality of Foci." Proceedings of the Royal Society of Edinburgh, Vol. ii. 1846. Maxwell, James Clerk, "Illustrations of the Dynamical Theory of Gases." 1860. Maxwell, James Clerk, "On Physical Lines of Force." 1861. Maxwell, James Clerk, "A Dynamical Theory of the Electromagnetic Field." 1865. Maxwell, James Clerk, "On Governors".From the Proceedings of the Royal Society, Vol. 16 (1867-1868) pp. 270-283. Maxwell, James Clerk, "Theory of Heat." 1871. Maxwell, James Clerk, "A Treatise on Electricity and Magnetism." Clarendon Press, Oxford. 1873. Maxwell, James Clerk, "Molecules." Nature, September, 1873. Maxwell, James Clerk, "Matter and Motion," 1876. Maxwell, James Clerk, "On the Results of Bernoulli's Theory of Gases as Applied to their Internal Friction, their Diffusion, and their Conductivity for Heat." Maxwell, James Clerk, "Ether," Encyclopedia Britannica, Ninth Edition (1875-89). 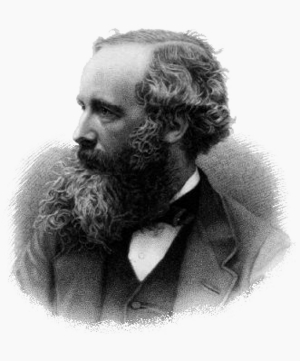 Works by James Clerk Maxwell. Project Gutenberg. John J. O'Connor and Edmund F. Robertson. James Clerk Maxwell at the MacTutor archive. Maxwell Year 2006 Celebration to mark 175th anniversary of Clerk Maxwell's birth. Rigid Body Sings song lyrics by Maxwell. Maxwell and the Christian Proposition. Maxwell, Molecules, and Evolution Explains the misuse of Maxwell's equations by Creationists. Maxwell's Treatise on Electricity and Magnetism Vols 1 & 2, and his introductory textbook on Matter and Motion. A Treatise on Electricity And Magnetism - Volume 1 - 1873 - Posner Memorial Collection - Carnegie Mellon University. A Treatise on Electricity And Magnetism - Volume 2 - 1873 - Posner Memorial Collection - Carnegie Mellon University. On Quaternions, Or On A New System Of Imaginaries In Algebra by William Rowan Hamilton - PDF File. An Elementary Treatise On Quaternions by Peter Guthrie Tait - Archive.org. Introduction to Quaternions by Phillip Kelland & Peter Guthrie Tait(Google Books). Original Maxwell Equations - Maxwell's 20 Equations in 20 Unknowns - PDF. A Dynamical Theory Of The Electromagnetic Field - 1865 Maxwell's 1865 paper describing his 20 Equations in 20 Unknowns - Predecessor to the 1873 Treatise. History of "James Clerk Maxwell"
This page was last modified on 16 March 2018, at 15:48.